Attendees: Stephenie Webb, Chair (@heyheymama); Scott Blevins, Vice Chair (@Scott_Blevins); Josh Wims (@JoshW); Brady Pamplin (@bpamplin); David Steele (@David_Steele); Troy Gilchrist (@TGilchrist); Shaun Dixon (@Shaun_Dixon); Logan Cummins (@loganc10); Tommy Thomas (@tomthm). Location: Purple Classroom. Duration: 60 minutes. The Board banned two member for not paying their laser fees. Members repaid the fees. Stephenie will not be running for Chair in October. If no one comes forward, her last act will be to shut down Laser Area (rope off with Caution tape) until a chair election is held. Ideally, if three people were willing to rotate 6 month terms, each could have a year off between serving. If a Chair only holds monthly maintenance + meeting and watches the finances, that’s good enough if the Committee is strong. Purpose: to set a precedent for single 6-month terms to strengthen the Committee, to prevent Chair burn out, and to retain Chair’s corporate knowledge. Brady and Clay have a device installed on a chiller that is monitored and its temperatures are uploaded and recorded and the current line count is up to 300,000 separate captured data points. Another example he presented to the group was a device he fabricated with a display, big red button, battery pack and it was run on a Arduino processor which also made it Wi-Fi connected. The device counted the time in between the pushing of the red button. This was a proof of concept of having a timer box to help clients keep track of time used on the lasers. Everyone was extremely impressed by this demonstration! Brady is currently seeking help with the following to continue development of the timer box: soldering; web development; tracking of ideas and development for the project. Essentially they need a project manager and documenter. Clay was nominated for this project and all in attendance voted for him to be on this project, to ensure that the air assist on the laser cutters turns back on after 15 minutes of being turned off. The premise is that a user needs to turn the air off because they are cutting acrylic. That same user completes all of their cuts which could be minutes or hours and they gather their belongings and leave, forgetting to turn the air assist back on. The next user begins cutting wood and a fire begins as the material that is cut isn’t blown out of the cutting area. This results in excessive smoke, contaminating the laser, damaging the lens, melting of plastic and in general making the laser unusable. Clay will work on this project and develop a solution which may include a timer box similar to what Brady presented and a secondary air feed so there is always some level of air flow. It was nominated for vote to purchase 1 additional rotary tool from the laser manufacturer Thunder Laser for up to $750 dollars. It was then voted on and approved by all attending members of the Laser Committee. Laser Basics: 684 authorized users. Square Payers: 153 unique credit card payers, made 383 transactions, paid $4140 gross. 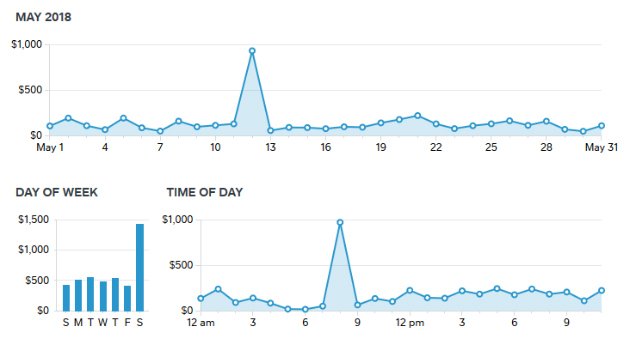 Spike due to $841 payment made by user who was caught underpaying; Board of Directors permanently banned member. Since I do not volunteer time on the laser committee, let me first say that I appreciate all you do and will support whatever solution you implement. Another option that might be possible would be to limit time spent on Thunder and Blitzen (picked at random) to some limited amount of time during the hours of 10am to 10pm (1 hour? 2 hours?) This would force long jobs onto Donner, or if they need Big Thunder it would have to be “off-hours”. That should keep two of the three queues moving along. ince I do not volunteer time on the laser committee, let me first say that I appreciate all you do and will support whatever solution you implement. An observation from a newbie laser user: Raster jobs seem to take up the majority of the time. Perhaps keep 1 laser reserved for vector-only jobs during busy times? Also … can we get one of these? If we get the one with both lasers, we can also laser-etch PCBs! The ability to perform no-contact engraving on metal is the number one request I’ve heard from members since becoming an active committee member. DMS does offer contact engraving through the Metaza in Creative Arts. Zach is referring to a dual source laser, fiber (for marking and etching metal) and CO2 (for cutting & etching plastics and organics, such as we have now). We’d be more likely to buy an Epilog so that our instructors and users do not need to learn a third system. An Epilog dual source laser starts at $50,000. An Epilog single source fiber laser runs $25,000. A Thunder Nova 35 (like Donner and Blitzen) runs $8,000. Given time, our Laser community does have the ability to raise the cash for more lasers, including dual sources and single source fibers. We are limited by space. We grow at 100-150 sqft per workstation, depending on a laser’s bed size. In our current location, we are using the aisles as workspace and we do not have maintenance egress between the wall and the lasers, between Big Thunder and Blitzen/Zing. We have very limited storage. I was able to show @Team_Expansion 15 minutes of security cam footage of someone attempting to crawl between the lasers to perform maintenance between the wall and Big Thunder. The safety issues were glaringly obvious. 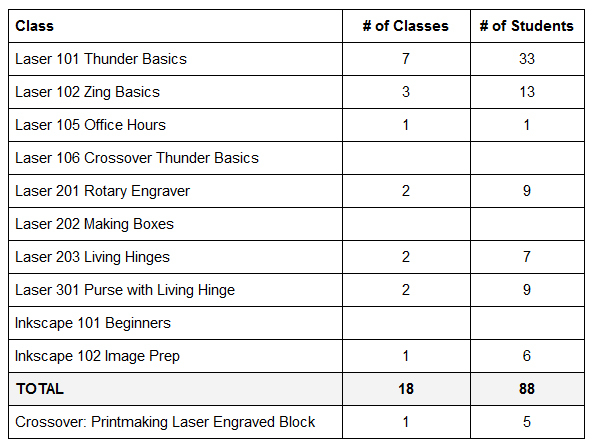 Also, I had photos of classes at all 4 lasers. The lack of student access was likewise obvious. Any new footage will address these concerns first. Then one workstation will be opened up to 180-degrees vs the current 90-degrees so we can have a teaching space without students parking chairs in the aisle. After - and only after - those current needs have been rectified, we will then need 100-150 sqft to add just one laser workstation to address growth. I hope this answers Zach’s question, one that others likely have had as well. EDIT: We have had 503 different members use the lasers in the last 365 days, up from 466 a month ago. The holiday season is not even upon us yet. Growth is a great concern. Very well worded Stephenie. All salient points.